Note: The Comedy of Terrors Blu-ray is available direct from Arrow Video. Director Jacques Tourneur’s penultimate film was The Comedy of Terrors, a macabre tale starring popular icons Vincent Price, Boris Karloff, and Basil Rathbone that became a failure at the box office. 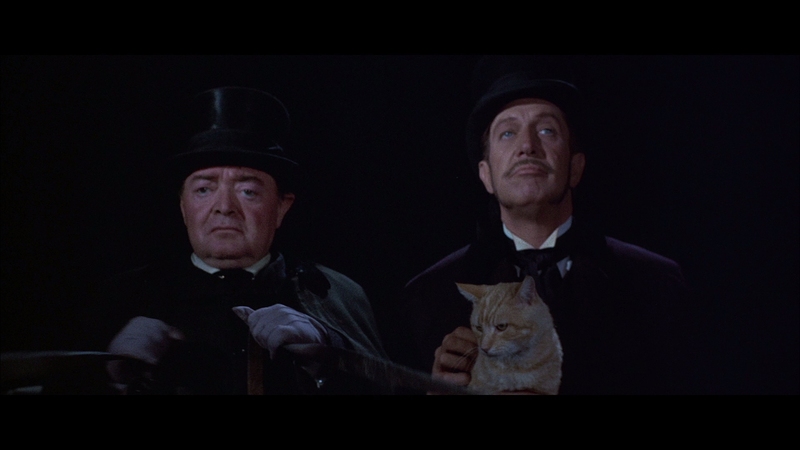 Also along for the ride was Peter Lorre as the trusted sidekick. Jacques Tourneur had made a name for himself decades earlier with such films as Cat People, I Walked With A Zombie, and Night of the Demon. 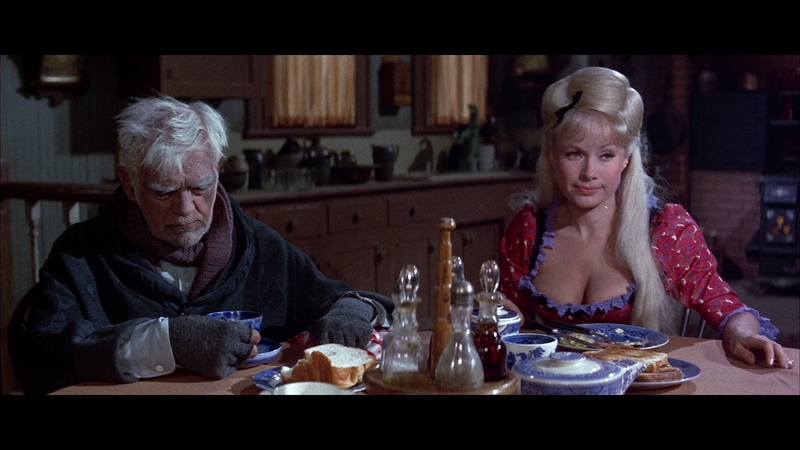 This 1963 production veers directly into comedy for the noted horror director. 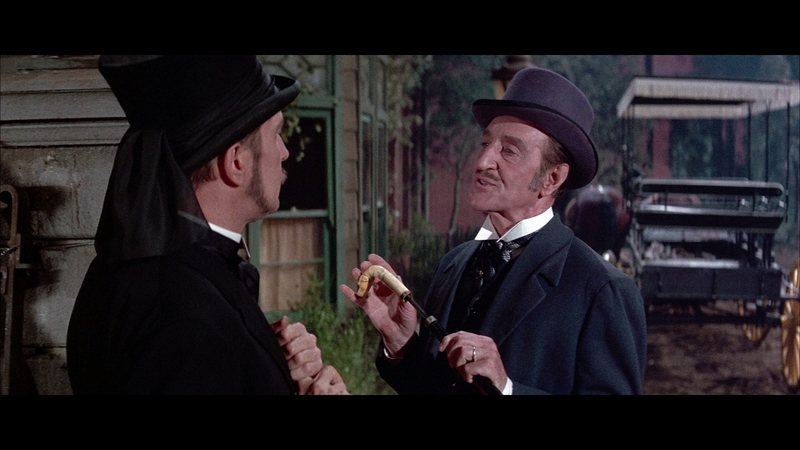 If you ever wondered where Scooby-Doo got its idea of a comical horror villain, look no further than Vincent Price’s turn in The Comedy of Terrors. Written by screenwriter and author Richard Matheson, the movie is full of laughs and takes full advantage of its legendary cast. An undertaker decides the best way to save his failing funeral parlor is drumming up business for it. He decides killing off rich people will gain him new clients. Vincent Price plays Waldo Trumbull, a man about to lose his business because he’s falling behind on the rent to Mr. Black (Basil Rathbone). 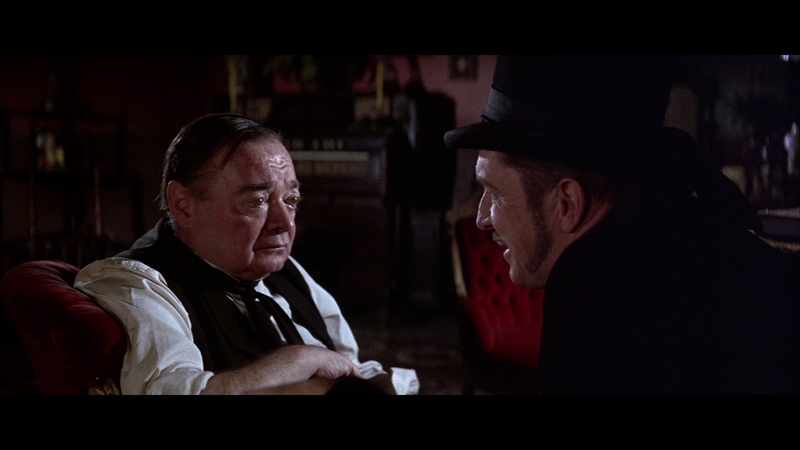 Trumbull is aided in his twisted scheme by his reluctant assistant, Felix Gillie (Lorre). 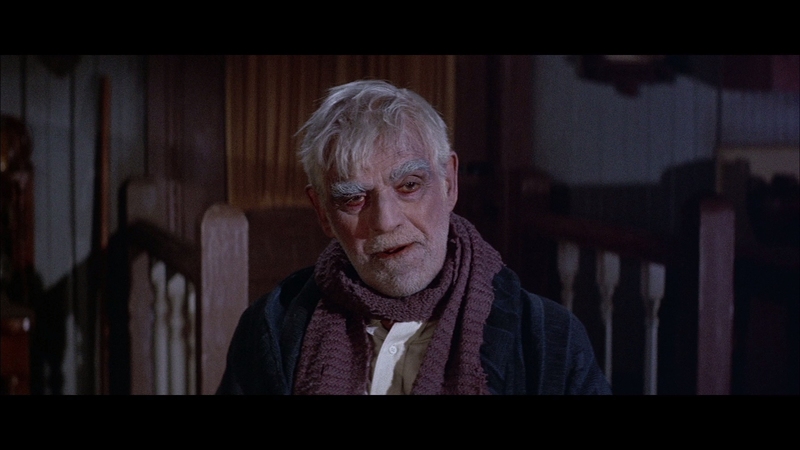 Trumbull lives with a man he wishes dead, his senile father-in-law played by Boris Karloff. Unexpected obstacles bedevil Trumbull’s scheme to save his business, including a man that simply won’t stay dead! Anything that can go wrong does go wrong, leading to hilarious twists and turns. The Comedy of Terrors shows an ear for sharp barbs in its dialogue. 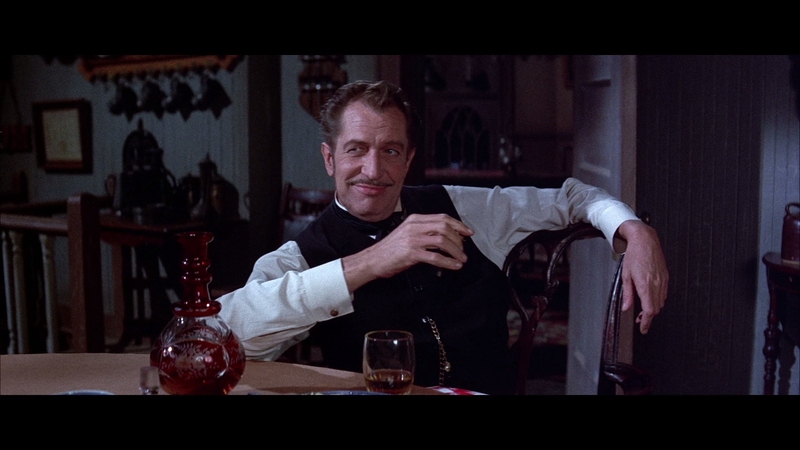 Vincent Price was a wonderful comedic actor that knew just the right way to deliver his villainous lines. 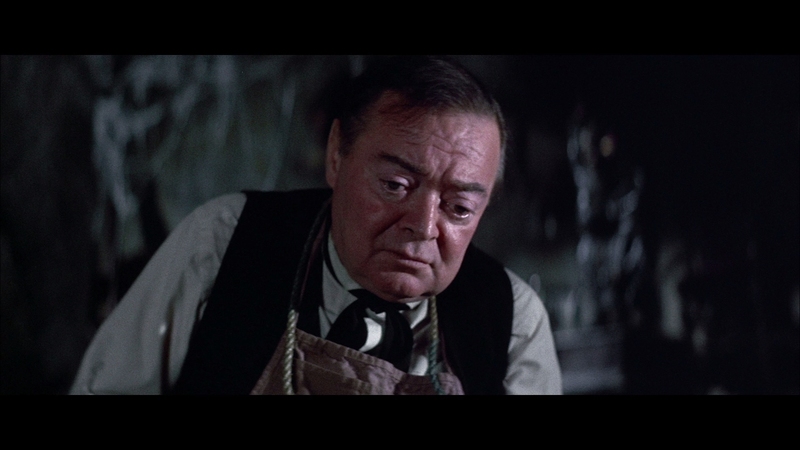 His chemistry and timing with Peter Lorre are impeccable, they are the reason why the film works as a comedy of ghastly errors. Rathbone and Karloff are not asked to carry a heavy load, the aging stars were near the end of the road and it shows. Rathbone does rise to the occasion in a couple of very funny scenes. His spoofing of Macbeth is comedy gold. 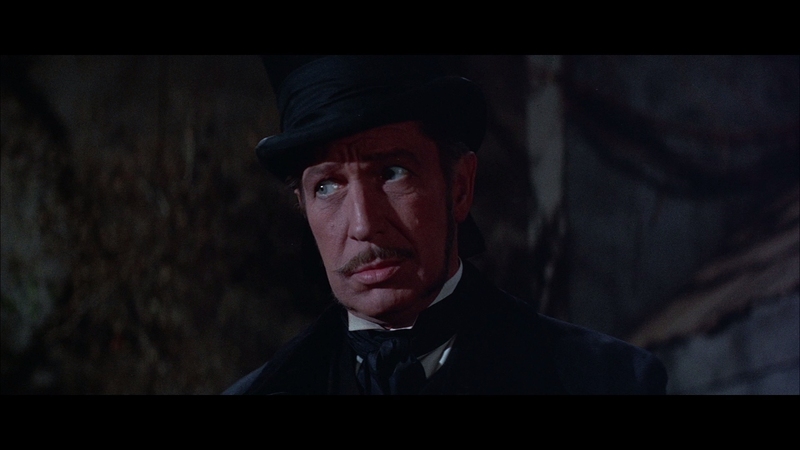 The comic styling of Vincent Price is probably not for everyone. They don’t make hokey comedies like this film anymore, the humor almost feels British in origin. This is not a long movie at only 83 minutes, but much of its derived pleasure is from knowing these actors before the film. I am not sure a viewer unfamiliar with Peter Lorre’s long acting career or the others would immediately be entertained by it. The Comedy of Terror echoes comedies from an even earlier period with its physical nods to the Silent era, including one too many pratfalls. 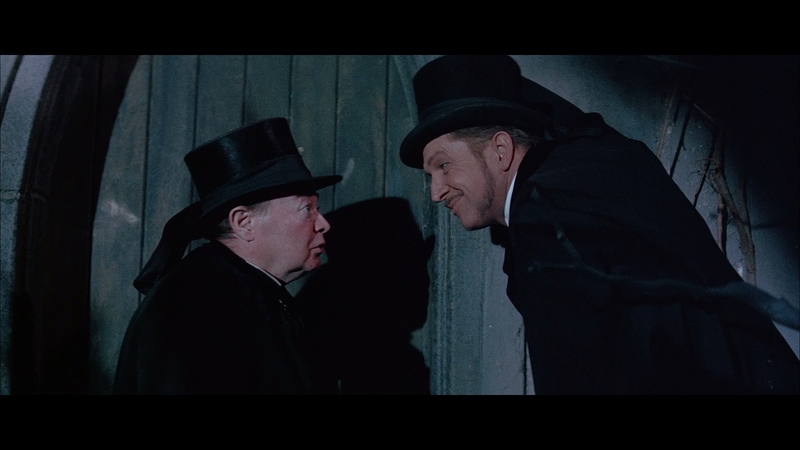 The Comedy of Terrors is a delightful gem for Vincent Price’s fans. Everyone else should be more cautious, especially if you dislike the older style of classic Hollywood comedies. I guess they can’t all be winners released by Arrow Video. The British distributor had to license the High-definition master provided by MGM, which limited their options. It’s an older telecine from secondary film elements in fairly rough shape, marked by noticeable processing. At its best one can call this Blu-ray a mediocre film transfer in 1080P resolution, at its worst can be characterized as a mild improvement over DVD. Arrow Video does restore one second of the film to its completely uncut status, missing on Scream Factory’s release. The strong AVC video encode on a BD-50 transparently handles the rough-looking print, the one saving grace of this Blu-ray presentation. The film elements are littered with both positive and negative damage, most likely an interpositive that has seen better days. This master was struck some time ago. The unrestored film has a mushy, noisy grain structure common to older telecines. Some harsh processing is evident, including direct edge enhancement. Detail is soft and rolled off, lacking the fine resolution of newer film scans taken from the negative. Color appears slightly off as well. The untouched color grading has over-saturated reds due to the other primary colors fading with time in these specific film elements. 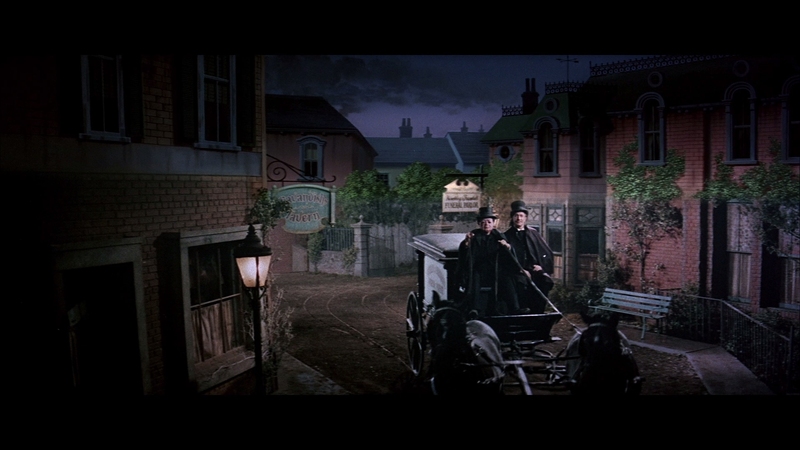 The garish color is not how audiences would have seen the film in 1963. Black levels are all over the map, faintly crushing shadow delineation in specific scenes. This is not a particularly good treatment for the box office flop. The film can and should look better on Blu-ray. Someone at MGM will need to pony up the money for a new transfer from better film elements. Arrow Video employs the original mono soundtrack in an excellent 2.0 PCM audio presentation. The sound has a rich, full character that capably delivers the dialogue and Les Baxter’s score. The fidelity has been crisply preserved over the decades, The Comedy of Terrors’ audio survives in a far better state on this set than the video. One of the comical elements that really tests the soundtrack’s dynamic range is Joyce Jameson’s operatic singing, heard in perfect quality with soaring high notes. This is a well-mastered soundtrack with pleasing dynamics. The original audio recording contains perfectly intelligible dialogue. Optional English SDH subtitles are included. They display in a white font and remain inside the 2.35:1 aspect ratio at all times. British distributor had to lock this Blu-ray for Region B. Region A users will have to be content with Scream Factory’s inferior edition with very few special features, found in their second Vincent Price Collection. Arrow does include a DVD version in this set as well. Like most of their better releases, Arrow includes a handsomely illustrated 24-page collector’s booklet. It includes new writing on the film by Chris Fujiwara, author of Jacques Tourneur: The Cinema of Nightfall. A striking reversible sleeve features original and newly commissioned artwork by Paul Shipper. Audio Commentary With David Del Valle and David DeCoteau – Vincent Price historian David Del Valle provides a wealth of insight and perspective during this commentary, moderated by David DeCoteau. The two men have good chemistry and this conversation flows without awkward pauses. Exclusive to this Blu-ray, the commentary might be more enjoyable than the film itself. Vincent Price: My Life and Crimes (51:40 in upscaled HD) – An engaging archival interview with the film legend from 1987. The extended piece covers most of Price’s long career and the elderly actor sharply recalls his experiences. This is actually a previously unreleased, alternate cut of the 1987 David Del Valle/Vincent Price interview that made it out on home video some years ago in a different form. Whispering In Distant Chambers: The Nightfall of Jacques Tourneur (16:57 in HD) – David Cairns takes a look at the director’s career in this newly made video essay. Richard Matheson: Storyteller (09:36 in upscaled HD) – An older featurette that was originally included on the ancient MGM DVD. Richard Matheson is interviewed about writing this film, sharing fairly candid production details. Full disclosure: This Blu-ray was provided to us for review as a screener that may not represent the retail disc. This has not affected the editorial process. For more information on how we handle review material, please visit our about us page to learn more.